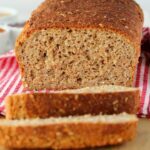 Easy 5-ingredient whole wheat bread. You just don’t get easier than this no-fail recipe. Hearty, wholesome, nourishing and delicious! Add the flour to a mixing bowl with the yeast and salt and mix together. Dissolve the maple syrup in the warm water and then add to the dry ingredients. Mix – don’t knead – until you have a sticky well combined dough. Transfer to a greased loaf pan. Cover and leave to rise for 20 minutes. While the dough is rising, preheat the oven to 390 degrees fahrenheit (200 degrees celsius). After 20 minutes when the dough has risen, bake in the oven for 40 minutes. Absolutely BEST when fresh, but will keep for a day or two in a closed container. After which you can make the most delicious toast. *Weigh your flour for the most accurate results. *Not all instant yeast packages are 11g, lately I have been getting packages that are 10g, and they work perfectly, so you don’t have to be that precise with the measurement of instant yeast. If you have a package of instant yeast that is a larger size, 11g is around 1 Tbsp of instant yeast. *If your dough hasn’t quite risen as high as mine in the picture at the 20 minute mark then leave it a couple more minutes, sometimes it takes a couple of minutes longer to get to the perfect height, but don’t leave it too long or it will rise too high and then you’ll get a muffin top loaf! *Prep time includes the 20 minutes spent rising.